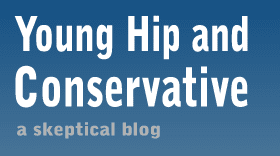 Young, Hip and Conservative: a skeptical blog: "The trouble is now the thought-experimenters are creating policy"
"The trouble is now the thought-experimenters are creating policy"
Thorium nuclear power advocate John Kutsch just narrated the perfect anecdote to the overly-enthusiastic renewable energy crowd. Not hiding his frustration in the least, Kutsch went at this from a pro-science perspective. That's what made this video really sing. Sadly, too many critics of solar and wind power destroy their own credibility by denying the reality of man-made global warming. Instead, Kutsch took that issue head on and the video maker backed up what he said with more arguments for why our current crop of renewables won't help the environment and won't scale. He even made a dig 19 minutes in at the local power source crowd. A subsection of the buy local crowd, these people thing power should be produced locally, even if it's incredibly expensive and wasteful. Kutsch does a great job of reeling in nonsense. Every moment is worth watching. How about, don't hit people? Are left wingers prepared to choose?